I’m excited. In a nervous in my belly, hopeful, anticipatory and grateful kind of way. 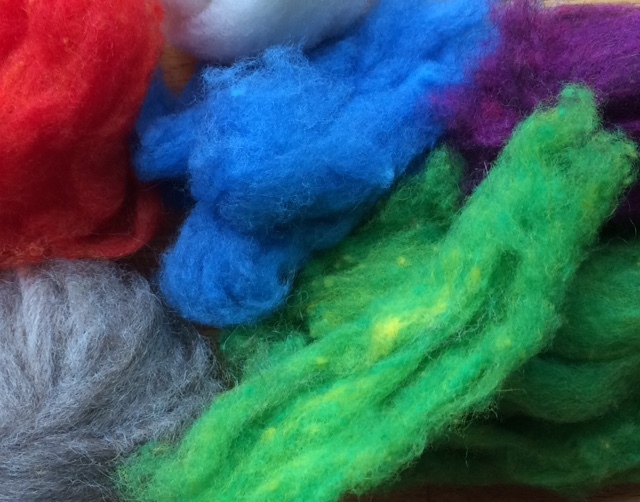 Tomorrow, I’m going into my daughter’s kindergarten class to do a felting project with the children. 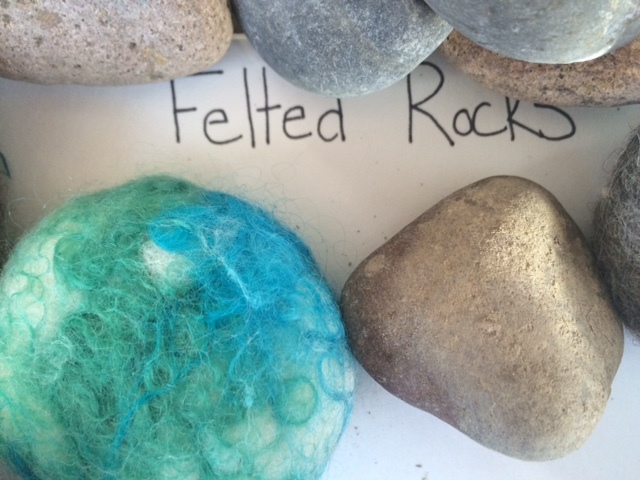 Felted Rocks, to be exact. And later in the week I’ll do the same project with two 2nd grade classes (my son is in one of them). I have come to seriously appreciate the benefits of working with, touching, experimenting and playing with fiber, and I feel utterly compelled to teach things to do with fiber-craft to kids. The felting rocks project begins what will be a five- to six- week journey that picks up after the holiday break, and I will keep track of how it all goes here. I am calling my unit From Farm to Frame. 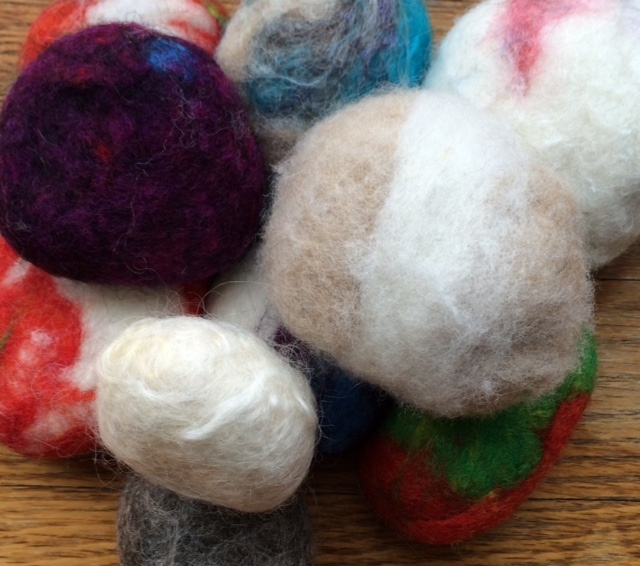 In January, we will start with a dirty, smelly, lanolin rich fleece (or part of one), wash it, dye it, card it and in the end make a felted “painting”. Over the last few weeks, I’ve been gathering materials for this project, thinking about why this is so important to me. One memory came to mind; the first time I skirted a fleece on my own. It was the big, smelly, creamy fleece of a Border-Leicester sheep that my friend Susi secured from a local farmer. I remember thinking, “dang, that smells”. But it didn’t offend me, and really, I got used to it very fast. I remember, after picking debris out of it and removing a lot of the gunky stuff, noticing how soft my hands had become. I was delighted to realize that it was lanolin! Lanolin had made my hands soft and shiny and smooth. 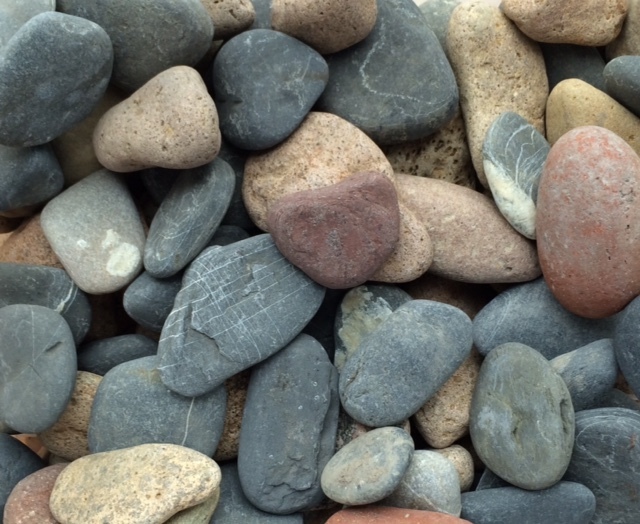 I stood there in the warm May sun and it occurred to me that in the process of doing hard work and getting my hands dirty, that I had been softened, conditioned and made-over. I’d say that was a turning point for me, about two and half years ago. Since then, I’ve wanted to know more about why and how working with fiber can be so grounding and therapeutic in all of it’s stinky and at times tedious moments. I want kids to have this. I want them to see a whole process through that involves fiber from a local farm. I want them to experience the rawness of the material and experiment with what they can turn it into. I want them to have an antidote to stress, pressure and worry. I want them to have a chance to touch nature and maybe appreciate the animals they pass on many a Vermont road. I’m so grateful that teachers are letting me into their classrooms with these projects. Let’s just hope that the kids enjoy it. Tomorrow’s project will be a good introduction for all of us, I think. pictured above: rocks gathered from Lake Champlain, felted rock experiments, many bags of wool and a whole lot of roving to be organized for the classes, more roving because I thought it was pretty, and some of the colors that the kids will have to choose from. 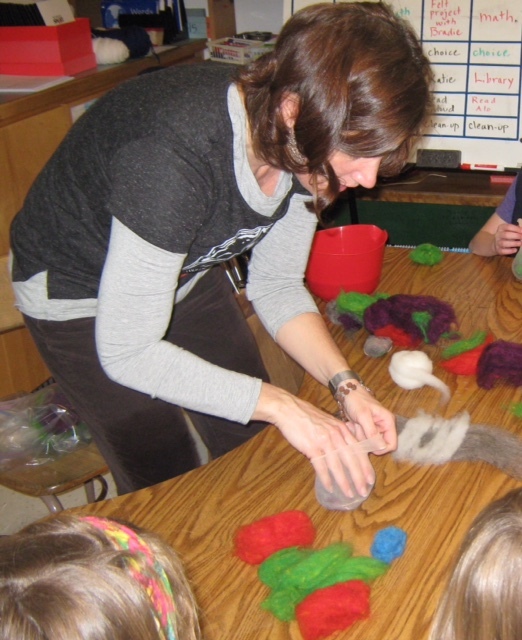 Categories: Fiber Art In Schools | Tags: felting, felting rocks, fiber art, healing, lanolin, skirting wool, teaching fiber art, Vermont | Permalink.